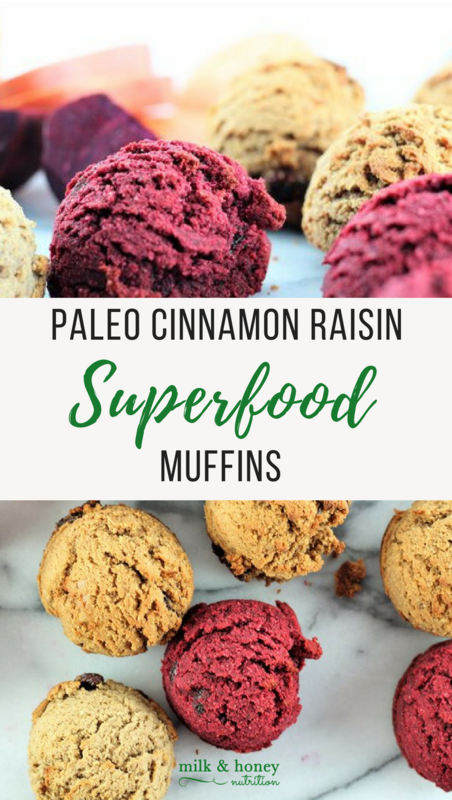 These Paleo Cinnamon Raisin Superfood Muffins are so versatile and sure to please any dietary lifestyle! They're a fun twist on my Paleo Sweet Potato Spice Muffins and can be made with any root vegetable powders. I used the Live Glean beet, sweet potato, and pumpkin flours. Preheat your oven to 350 degrees and grease your muffin tin. Combine the root vegetable powder and water in a large mixing bowl and mix to form a puree. Set aside. Add the remaining wet ingredients, and stir to combine. Add all remaining dry ingredients to the bowl. Using a rubber spatula, mix just until combined. Bake for 25 minutes until tops start to brown and a knife inserted in the middle comes out clean. Let cool in the pan for 3-4 minutes, then carefully transfer to a wire rack. Enjoy!